A couple of days ago, I shared a quick pic of the boys tackling a few of the tasks on our twenty-minute power clean list. This is a new idea/effort that I'm hoping will become a habit that will help us all keep the house a little cleaner before baby arrives. Since we've been working on it for a week now, I thought I'd write a little bit more about how the idea has taken off. There are a couple of reasons why I decided to rethink our current housekeeping plan. 1. I'm nesting in a major way (almost 38 weeks)! 2. The boys' activity and school schedule is so full that finding time to clean is becoming more and more difficult. Read: the goober/dirt magnets I'm raising are taking over the house, and I cannot handle it any more!!! Steve and I feel that it's very important to teach the boys good stewardship and generosity by requiring that they share in the maintenance of the home. A big family = bigger messes, more dishes, laundry, etc. etc. So we have to work as a team to keep the house running efficiently. Everyone around here helps out in some way, even the little ones. But lately, especially with the older boys devoting more time to their studies and sports, it is becoming more and more challenging to tackle even the basic daily and weekly chores. And moms, for what it's worth, the housekeeping duties should not fall upon your shoulders alone. The home is the perfect environment for children to learn so many vital lessons on virtue and to also develop life-long skills that are unfortunately under appreciated and underrated, but no-less important to daily living and family harmony. With our seventh angel due to make his/her entrance into the world any day now, I decided to come up with a simple, yet effective way to spread the housekeeping tasks out during the week, instead of trying to gather the troops to tackle the entire house in one laborious event. This isn't really a new or novel idea, but for what it's worth, I'm throwing it out there for anyone who is also reconsidering the distribution of major chores during the week. 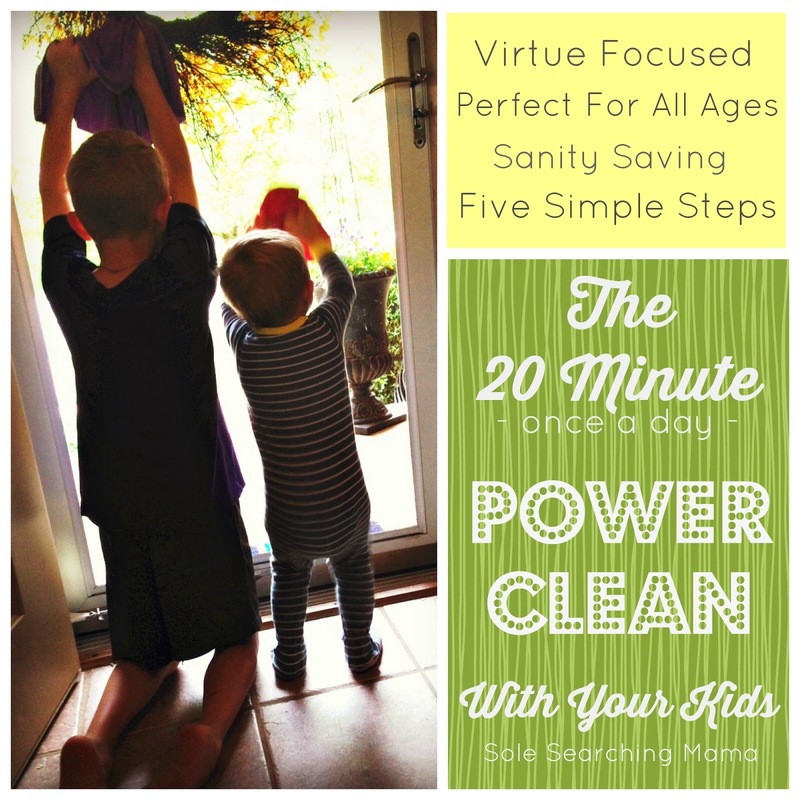 Since we homeschool, I like to begin the day with our 20 minute power clean (that's what we're calling it). But, if you have kids at school, you could always try to squeeze it in after they get home, or right before/after supper. The goal is not perfection, because there will be those days when things just don't go as planned. But, with consistency, I'm hoping that the home will not only be a more ordered and clean environment for us all, but a more peaceful one as well! We keep it simple. Spontaneous prayer, the Our Father, Morning Offering or Angelus, then one of the boys reads a scripture passage for the day. I choose the verses ahead of time and make sure they are always virtue-centered so that they reinforce obedience, generosity, sacrifice, joy, helpfulness, attentiveness, kindness etc. You can Google "bible verses on (insert specific virtue)" to find a great just what you're looking for. No need to go into a long lecture here, just keep it sweet and simple. They'll be getting a small dose each day, so (fingers crossed) much of the teaching will eventually sink in. 2. Write the daily list of tasks on a white board or piece of paper. Let the kiddos check the chores off as they go. They love to do that - it gives them so much satisfaction! And, it helps you to see what's been done in relation to how much time is left. I like to start with asking for volunteers, and if there are not takers for the task, it simply gets assigned. Then, I briefly review how the tasks are to be completed if they require any instruction. I try not to labor to heavily over this. Things won't be done perfectly, but with praise and encouragement, the children will improve from week to week. Any task that is not completed will be finished before lunch or the next privileged event. *See our list of tasks below. 4. Turn on the music! This is a really important step, and one not to be skipped because it gives us as parents the opportunity to praise and thank our kids, but also to teach them the value of finishing a task and finishing it well, as well as learning to embrace constructive criticism. I discovered this week that if I praised the boys individually to their father at the supper table, they worked even harder the following day! This one is totally optional, and I'm not always big on rewards, but in this case, it's a necessary good. The boys know I'm a bit of a sugar nazi, so the thought of receiving donuts or a cereal of their choice on Saturday morning is highly motivating! Of course, this may not interest your older children, but perhaps a cash allowance or something more suitable to their ages might be. 1. Norwex Enviro Cloths. I know they are pricey, but so worth the investment. They clean EVERYTHING so well (even stains off of carpet! ), and don't leave streaks. I can give a damp one to my toddler and turn him lose around the house. He loves to wipe down his high-chair and the bar stools for me. 2. Bona Mop System. I really love this for our kitchen floors. Nothing beats a good old fashioned hands and knees clean for the floors, but this is a great way to maintain the deep clean during the week. It doesn't leave streaks and is easy for kids to use. If we had more hard woods in the home, I would probably invest in the Norwex mop system, but since our kitchen/dining space is small, this works for us. 3. Baby wipes. Sounds crazy, I know, but we use these for detailing the car interior, because they are gentle and don't leave streaks or film. 4. Thieves Multi-Purpose Concentrate from Young Living. This is my go-to cleaner that I can let the boys use without worry over toxicity. It's the germ bomb, and a little goes a long way! How do you tackle household tasks with your family, and what are your favorite products? ?